Plasma cut to perfection aluminum case with heavy duty stand (20 x 20 x 36) weighing 60 lbs and can be used in conjunction with our Work Table or yours. Speed Control Adjustable (Zero to Ninety RPM) using a potentiometer. Ceramic tensioner, so sensitive it can make small or fragile stemmed items all the way up to 1" in diameter utilizing 15 gauge wire up to 28 gauge. 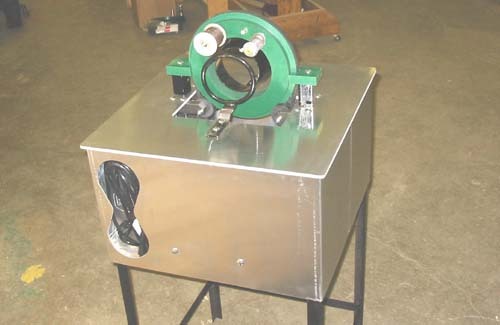 90 Volt DC Fractional Horsepower motor with 43 inch pound of torque drawing only 1.3 amps with 11:1 ration gear which gives you the same performance as a 1 1/2 hp motor. Our unique and reliable design allows the machine to be run through a standard 110 AC outlet. High Efficiency... the machine will produce as much garland as the operator can do. Maintenance Free... no oiling or lubrication. Self-cleaning... soap and water clean up on the wheel is all that is necessary. Lifetime Warranty on Mechanical and Workmanship... 5 year Warranty on Electrical. Instructional Videos or DVDs Available. We ship Worldwide (UPS - Spee Dee Delivery - Common Carrier). Options Available Include: Work Table, Counter and Sidewinder. 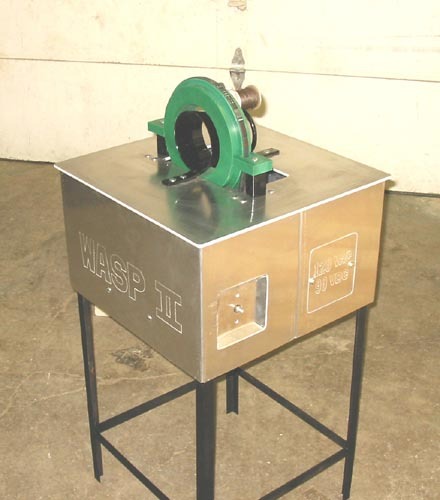 Both "The Wasp" and "The Wasp II" Garland Machine can be easily converted to 220 Volt 50 Hertz for our European customers... Call for European Distributors. Northwoods Evergreen & Wire LLC has been building garland machines since 1973. We still use the same original DC motor we have had one the market for over 30 years. We spare no expense on the motor because we want our customers to have a durable and reliable machine. The motor runs quiet and produces little heat or noise and is more motor then needed. That's why you can count on our garland machines season after season! 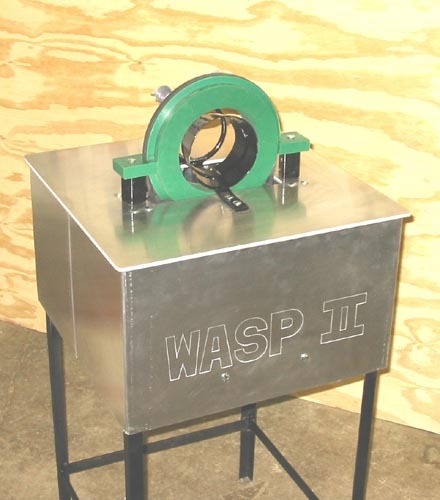 The Wasp Garland Machine features speed control that runs continuously. This machine is very simple to operate. You just turn it on, set the desired speed and begin to make garland. 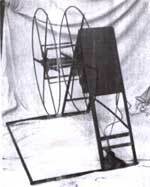 The Wasp II Garland Machine features a mushroom momentary switch. When the knee switch is depressed, the machine runs until you remove your knee. It takes 1 3/4 pounds of pressure to activate the switch. This machine also features speed control. A workhorse for winding up your roping or garland. The Sidewinder eliminates the hassles and tedious hours of hand winding. This item was created for people who are looking for a faster and easier and faster way of rolling up roping. The Sidewinder will wind up to 100 feet of street roping in approximately one minute with no effort. You're winding with the bough, not against it. All rolls are more compact and tightly rolled for more efficient storage. The rolls will also take up less room on your loads.